Visual inspections are essential to the health of your crane, but what you don’t see can hurt. For the longevity of your crane and minimum downtime, it is important that crane specialists take an in-depth look at your crane, whatever make it is. The Gear Case Inspection assesses the internal gear case components and is designed to uncover issues that may lead to hoist gear failure. This includes pre-mature wear on the gear teeth, damaged bearings and worn seals. The Bottom Block is made up of many internal components that are critical to carrying your loads. The Hook/Shank Inspection is designed to look for wear and cracks that could lead to failure in any of these components. Serviceability of the safety latch is critical for accident prevention. Apart from that, the sheave wheels, bearings and covers are also inspected to determine if lubrication is sufficient and that components match. The RopeQ™ Magnetic Rope Inspection has been designed to assess the condition of a wire rope. This is done by a deeper assessment than the usual visual inspection. Purpose build equipment and software assess and report defects on and inside the wire rope, including worn or broken wires, strands and core that are not readily visible. The Crane Reliability Study looks at the current condition and remaining life of your crane. A team of trained and experience Konecranes specialists gather detailed information about your crane, perform an inspection using specialized tools and methods and conduct an engineering analysis. Calculations are based on designed duty, actual duty, age and service history of the crane and reporting will suggest some dates on which certain machineries should be overhauled or replaced. Geometric Analysis developed by Konecranes, work together for a total look at crane and runway geometry. Cranes that are running straight, square and are aligned experience less repair costs and are more reliable. The two parts of this service include RailQ and CraneQ. RailQ Runway Survey typically utilizes a remote-controlled robot trolley which runs along the rail. Surveying equipment gathers information as the robot is remotely run down each rail of the gantry. The analysed data is processed and presented in reports which help visualize problem areas. CraneQ Crane Geometric Survey utilizes the same surveying equipment to gather information on the travel wheels of the crane. The analysed data is processed and presented in reports which help visualize details on the alignment of wheels and the square of the crane. Truconnect Remote Monitoring facilitates remote monitoring and reporting on a crane’s performance as well as the operator’s handling of the crane. This can either be done live through online access, with alerts via mobile phone or reported monthly via e-mail. 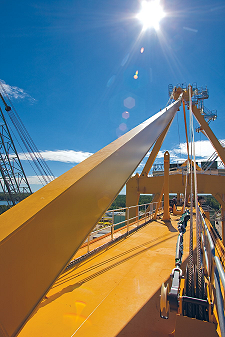 This data allows customers to make informed decisions on maintenance, production and operations to decrease downtime and increase the productivity of cranes. When it comes to parts and service, it doesn’t matter who made your crane. Konecranes offer genuine Konecranes spare parts as well as replacement parts for all other makes and models.